You can ship your T-shirts UPS, Fed Ex Ground or via the US Post office. We set up to cut your T-shirts. During this process we create a label with your name on it and put the label on a clear plastic box. We keep all the cut blocks and paper work in this box for the duration of the project. We try to cut your box of T-shirts within 48 hours of them arriving at our door. Our goal is to get your T-shirt in a plastic box as soon as possible. However, we will only open one box at a time. We count how many blocks of each size you have. Once all of your T-shirts have been cut and counted, your box goes into a queue rack. The queue rack holds the boxes of cut T-shirts that are waiting to be worked on. All of the blocks are put into your box. We then calculate the size of the quilt and e-mail you with the size. Upon your approval of the quilt size. A map of your quilt is drawn with a computer drafting program. The pieces are manually manipulated and placed. This is for internal use only. This map IS NOT sent to you for your approval. Next, each of your blocks is assigned a spot on the map. Q: Can we send you a photo of what your quilt will look like before it is sewn? A: No, because we never physically lay a quilt out. Then we sew the quilt top. 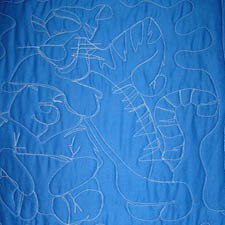 Long arm machine quilting of your quilt. Each block on your quilt gets it's own special quilting design. The designs are either tracings or free form designs. 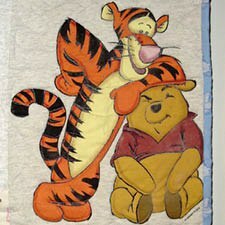 The block with Pooh and Tigger is quilted from the front and the quilting shows up on the back of the quilt in reverse. Without the image on the front, we would not be able to quilt (draw) this design. So without something to trace, we cannot free hand designs. The binding is a strip of fabric that runs around the edge of the quilt to finish the raw edge of the top, batting and backing materials. Cleaning all of the strings off of the quilt. Most of the time we return ship your T-shirt Quilt via UPS.